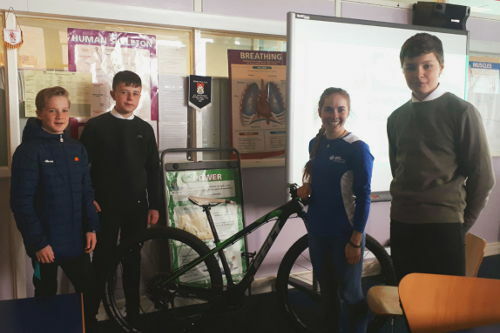 34 first and second year pupils at Newbattle High School heard an inspirational talk from Commonwealth Games mountain biker, Isla Short. Isla, who has just recently returned from the Gold Coast where she placed fifth in the women’s mountain bike race for Team Scotland, discussed her journey into professional sport and how she lives her life as a performance athlete. The event was organised in collaboration with the school’s PE department and Midlothian Council IBike Officer, Roslynn Newman. Many of the pupils who participated are keen cyclists and later took part in a cycling taster session as part of their PE lesson. “Delivering a talk about my journey in bike racing to a group of first and second years at Newbattle High School was a great experience.